Notre Dame got the overwhelming majority of its recruiting work with the Class of 2019 finished a couple months ago, when the Irish signed 21 student-athletes during the early signing period. 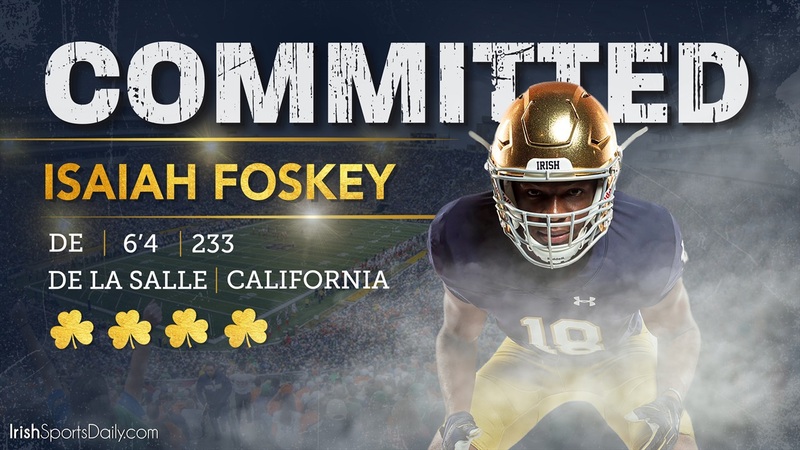 But they weren’t completely finished and on Wednesday, the Irish added another member to the class, California defensive end Isaiah Foskey‍. The De La Salle product joins a defensive front that already includes defensive tackles Jacob Lacey and Hunter Spears along with ends NaNa Osafo-Mensah and Howard Cross. The 6-foot-4, 233-pounder’s addition doesn’t come as a huge surprise with Notre Dame being considered the favorite since a visit to South Bend in the summer. In fact, there was even some suggestions that Foskey actually had signed during the early period, but just chose to wait until today to make it public during an announcement on ESPNU. Following that initial summer trip to Notre Dame, Foskey returned for an official in September. And while he talked about potentially taking more trips as late as last month, he never did, removing much of the mystery here. The four-star from Concord, Calif., also had offers from schools like USC, UCLA, Oregon, Washington, Cal, Alabama, Clemson, LSU, Florida, Ohio State, Michigan, Penn State, Texas and Nebraska among several others. Foskey was initially listed as a tight end earlier in his prep career, but his upside is greater on the defensive side of the ball and that’s what the Irish are bringing him in to play. While the Irish poked around on some other 2019 prospects over the last couple months, most of their time was devoted to Foskey and California linebacker/safety Asa Turner. Turner was a longtime Washington commit, but remained intrigued in Notre Dame enough to put off a scheduled signing ceremony last month. At one point, it seemed like the Irish were poised for the coup, but Turner always felt more comfortable at safety, the position the Huskies were recruiting to play, while Notre Dame remained honest about its plans to play him at Rover, a linebacker/safety hybrid spot. Last week, Turner affirmed his commitment to Washington. The Irish can now officially turn all of their focus to recruiting prospects in the 2020 and 2021 classes and beyond.